.Sooo I thought I would have time to post some prom pics before we left but I didn't my apologies... you will have to wait until I get back from vacation. It went great... Alex walked into Ruth Chris for dinner and also INTO prom! Today we got up at 4 and left the house by 5:30 to head to JIA. Here we sit because you know we like to take the scenic route with life and our flight was delayed giving Alex the chance to meet EVERYONE in Jacksonville airport, lol. Originally we were to fly to ATL at 8:30am and then fly straight to Hawaii. NOW we are leaving at 10:00am flying to ATL changing planes. In ATL Chad and Nick will take a seperate flight from us however we all meet up again in LA and change onto another plane all going to HAWAII. Instead of arriving at 4pm in Hawaii..... we will be arriving at 9:00pm. The good news with all of this..... WE FLY FIRST CLASS!!! Funny God has a way of working things out for us because who doesn;t want to ride FIRST CLASS! Once again God.... thank you for taking the scenic route and letting us arrive to Hawaii safely in your timeline and not ours!! Signing off for now..... will keep you updated throughout the week if I'm not having too much fun, lol!! Keep us in your prayers..... for sanity and all! Check out Alex's progress on how he is doing walking by himself these days! Getting stronger and faster... THANK YOU GOD! Alex was timed 3 weeks ago on his fast walk with his therapist and completed the hall walk in 19 seconds, yesterday he did it in 11 seconds! WOOOHOOO! Alex getting on mat.... he has improved soooo much and is really doing great getting on his knees learning to shift that weight to his left leg. Prom is tomorrow night and he is sooooo excited! I will be sure to update you all on how his big night goes! He will be looking sharp...that's for sure! DREAMS COME TRUE....BOY DO THEY EVER!! OH MY GEEEEEEEEZE!!! Today was just an incredible day..... DREAMS COME TRUE has given our family the trip of a LIFETIME! I never in all of my wildest dreams thought we would ever be taking a trip like this! THANK YOU THANK YOU THANK YOU TO DREAMS COME TRUE AND THE MANY MANY SPONSORS THAT ARE MAKING OUR TRIP A DREAM COME TRUE FOR OUR FAMILY! We will be leaving on Sunday out of Jacksonville at 8:30am, changing planes in Atlanta and then HAWAII bound for 7 days!!! WOW! We will be staying at the Sheraton Wakiki http://www.sheraton-waikiki.com/property/overview I AM IN AWE!!! Here is our itinerary so you can all think of us next week and will know what we are doing, lol. Everything I have listed are compliments of DREAMS COME TRUE!!!! And they gave us spending money to boot!!! HOW INCREDIBLE IS THIS GOING TO BE?????!!!!! Alex's response once the trip was revealed with all the details.... "HELL YEAH!" hahahahahahaha! He stood and did his own little hula dance all by himself! 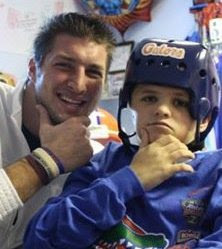 They also gave him a letter from Tim Tebow as he was invited to surprise Alex, but couldn't be there today. If I didn't know better I would say that he loved that the most at that moment in time as all he has talked about since is the letter and getting it framed, hahahahaha. Well maybe he has mentioned the trip a time or two....well that's all he has talked about.... WHO GETS TO SURF IN HAWAII ON THEIR 18TH BIRTHDAY??? 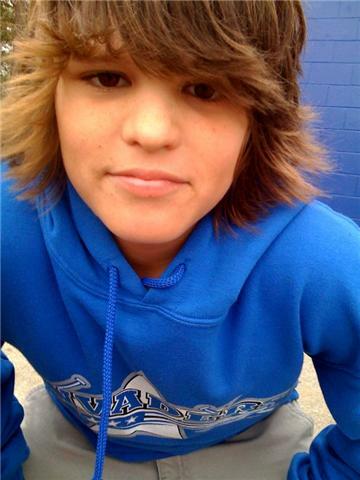 ALEX MICHAEL ROSS!! I cried the whole dang time she was telling about our trip... I just cannot believe it! Now I finally feel like I am going to Hawaii, lol. People have been asking me if I was ready but since I haven't planned anything.... it didn't really feel like we were going. PINCH ME PLEASE.... I CANNOT BELIEVE IT'S REAL! Nick is also going but he was in Tampa today and cannot come to Jax until Saturday because of work and school. So I am stoked that I get my WHOLE family to myself for 7 days!!! Me and all my MEN! On a vacation of a lifetime.... away from REALITY and into a DREAM! I may not want to wake up, lol! THANK YOU GOD FOR MY MANY MANY BLESSINGS YOU CONTINUE TO SHOWER ME WITH!!!! THANK YOU DREAMS COME TRUE for blessing us with this most wonderful trip that we will NEVER forget! Tears streaming down my face.... words cannot begin to describe how very grateful and thankful I am today ..... not only for the trip but because of this ordeal, I have encountered so many many many wonderful people whom I now can call my friends. I have angels beyond measures and prayer warriors galore.....THANK YOU ALL....from the bottom of my heart.... for following, for praying, for loving, for supporting....THANK YOU....YOU GET ME THRU MY DARKEST OF DAYS...and yes I still face them from time to time, but your prayers, love, support and emails keep me going and marching forward. I hate to end such an awesome happy blog with a much needed sad prayer request but you know God has his own timeline and I just received this email as I was blogging so I had to put in request! Hey Lisa, I just wanted to ask a big favor of you. Could you please ask all your prayer warriors to please pray for my friend Stephanie son Josh. He and his friend were in a terrible accident last night off of 121. His friend R.J. didn't make it and Josh is in ICU at Shands in a medically induced coma for 4 days right now due to the bleeding and swelling on his brain. If anyone knows about brain injuries you do and have been so strong through it all. Maybe you could send some words of encouragement to Stephanie and her family. I know you guys are getting ready to go on vacation in Hawaii, but if you could please get some more prayers going for Josh and the families involved, I would greatly appreciate it! I have included a link so that you could read about it if you wanted to. Thanks Lisa, hope you all have a wonderful vacation! Everyone of you deserve it! Lord I know exactly what those parents are feeling right now and I pray that You give them peace and comfort and that you work in and thru those nurses and doctors to give the best care that boy needs. I pray that you wrap your arms around the parents of both boys, especially, R.J., the one who came to see you Lord. If anyone knows best, I do! That all this is in your hands and you do things in your time line not ours. I know what you are capable of Lord...... I know the miracles that you can perform and I ask that you show us another one of your AWESOME miracles and pull Josh thru and put him on the road to recovery. I give you all the Glory, Honor and Praise Lord.... You are the ULTIMATE healer and I know all things are possible with you. I pray this in Jesus name... AMEN! Every time I hear of something like this..... my heart goes right back to day one and I can feel it all over again as if it were yesterday. I wonder if that gut wrenching feeling ever goes away? Will I ever be able to NOT feel it? It is always so very vivid and my stomach just hurls and hurts when I think of what those parents..... any parents that go thru what I've gone thru. I want to jump in my car and rush to the hospital to give them some positive hope.... that they can get thru this, it's just a bump in the road. I sometimes feel like I should just hang around the hospital... hoping that I can touch someone and get them thru the first couple of weeks. It is the worst feeling in the world....the roller coaster you can't wait to get off of and even though I am off of that roller coaster... God put me on a different one, just not a life or death rollercoaster but one that involves all the other aspects of my life. As I said yesterday.... if I could give back all the many opportunities Alex has been given over this past year with the meet and greets with celebraties and free tickets and meals.....I would forego ANYTHING of that nature to have my boy back. Yes it's nice and it helps us along the way to sometimes forget for an hour or two what our lives are really like.... but nothing can replace the boy who Alex once was. Please don't get me wrong... I am very very grateful for all that we have encountered since Jan 6th 2010..... but never for a minute think that this is what we want for our lives or that we somehow feel like we deserve any of it. The truth of the matter is..... there are angels watching over us and some pretty awesome people in this world and ONE who is outta this world.... that truly bring the joy into our world, make us smile.... make us better people. COUNT yourself as one of my many blessings because of YOU...... reading this right now..... YOU are one of our most treasured gifts of all through this! THANK YOU! limo, Ruth Chris and prom. It worked out that he now has 8 of them going together and I am soooooo excited for him! You know mom won't be far... I'll be in the front with the driver if it all works out as planned, lol. I figure I'll hang out lurking in the dark, lol. Rhonda, his personal photographer and myself will make the best of the night, just thankful that he is here alive and wanting some independance to hang out with his friends and be a normal kid again. She will be there to catch the special moments of the night with the blink of a flash and create memories that God has so graciously given us. Ok so far you get that Friday is prom, Sunday is Hawaii..... you think my wheels are spinning or what? On top of all this... yes SCHOOL is to be completed by Tuesday. The problem with this is.... you know he is on compass odyssey... well it shows how many folders are left and he had like 4-5 in each subject. IN THOSE 4-5 FOLDERS are MANY MANY assignments lol. I'm thinking they had like 3-4 assignments maybe 2 quizzes... WRONG. One folder had like 9 assignments and 3 quizzes!!! We have been sitting in front of the computer like NERDS for days and days now still lots to get done! Hawaii will definitely be a NICE BIG BREAK from the real world no doubt! It will be back to the grind once we get back and that will be the last stretch home to graduating....THANK YOU GOD! Much respect to those who home school their children.... especially those who homeschool children with BRAIN INUJRIES! In therapy Alex has had some trouble with his left ankle rolling so we had to get him fitted for a new leg brace as since he has grown the old one does not fit anymore. While we were getting fitted for the brace at Wolfson's, Alex made a comment about how he wanted the bicycle that was in the gym we were in. How God works.....the lady doing the fitting said she had a foundation that she had special people donating money and she takes that money and BUYS CHILDREN ADAPTIVE BIKES .....AND...... PUT HIS NAME ON THE LIST TO RECEIVE ONE BY MAY /JUNE! HOW AWESOME IS GOD!!!! She calls it a FUN BIKE.....I call it a FAT BURNER, lol. Sooo excited he will be getting exercise while riding with us on our bikes!! We had been looking into getting one for Alex for his birthday, March 30th but they range anywhere from $700-$1,500 on up! God always seems to put us in the right place at the right time....continuing to shower us with his many blessings. Hopefully the brace will be in soon so he can get the full extent of therapy as it seems to hinder his ability to really walk on it a whole lot. Ms Kate and Ms Erica have been working on weight bearing on that left leg doing different exercises on the mat trying to get him to trust that left leg more. Once the brace comes in they can focus on the walking aspect again more aggresively. He has been doing great at Day therapy..... getting better with learning to relax himself.... he can sit longer in rooms by himself without freaking out as much..... his attention span seems to be getting longer at short intervals..... LORD HELP US ON THE 10 HOUR FLIGHT TO HAWAII!! Everyone on the plane will know Alex by the time we get off, lol!! We went to the Sharks game Friday night and you know Alex had to go on the field after the game and get him some pics from the cheerleaders :0) He is a HOT MESS FOR SURE! Sat night Heather took him to the Supercross with two of his friends, Corey and Drew! Thank you Heather for taking him and Thank you Corey and Drew.... it meant the world to us both! THANK YA'LL FOR MAKING TIME TO SPEND WITH ALEX ON A SATURDAY NIGHT!! Alex said to me the other day while on the way to therapy.... "Mom, you know if this never would have happened to me, I never would have gotten to meet Tim Tebow, Reggie Nelson, Maurice Jones Drew, go to Hawaii or Pro Day"? I said... "Alex I would give all that up in a second to go back to January 5th and have my old Alex back". He said.... "Me too mom... me too!" No amount of money, fame or football stars, trips.... any of it I could do without ALL OF IT to have my Alex back. Sure it's nice, but I still struggle with wanting my old Alex back on a daily basis and wanting my life back to the way it was. All of the perks we have gotten I am very grateful for but I would give it ALL UP in a heartbeat to have Alex back to what he was. I still miss him with every beat of my heart and it is unbearable at times to not cry while watching him trying to learn to walk again and see the struggles he faces daily with all that he has to overcome. I feel sorry for him and thankful for him at the same time. So much has been taken away from him and he has missed out on so much as well as I. I can't get any of it back, I can only look towards the future and I know in my heart of hearts that God has great things in store for Alex Michael Ross. Sometimes it's just really hard to sit back and wait.... even though I know the best is yet to come! 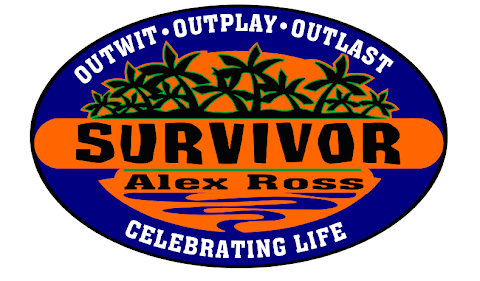 Tomorrow is the big day for the REVEAL of our Hawaii trip that Dreams Come True has given Alex and we can't wait! I hope to blog about it tomorrow night and fill you all in on the details.....VACAAAAAAAAAAAAATION HERE WE COME!!! THANK YOU "DREAMS COME TRUE"!!! ALEX SWIMS FOR THE FIRST TIME! It's been a week of improvements since my last blog. We had a conference with all of his therapist that he see's on Tuesdays and Thursdays that he is at the day treatment program. Alex is improving in many areas.... learning to control his impulses..... learning patience..... appropriate behavior.... time management.... he is getting better with attention and focus span and I believe his cognitive therapist said he was focused for about 20 minutes yesterday which is awesome!! We did school from 11-4 on Monday and he thought he was going to die, lol. He kept trying to get me to stop and I kept on pushing until he had accomplished what I was satisfied with, ha ha. I was told that Alex can not get/understand dry humor.... it's either black or white and whatever you say is what he takes at face value. The psychologist explained it as.... imagine Alex is blind and whatever you tell him is what he believes. Like when I explained last week that Chad came in from running with his running clothes on, sweaty and Alex asked him where he had been. You and I make that connection with the running clothes and sweat.... Alex does not. Chad told him he was doing his taxes outside and Alex took it at what Chad said. Then he couldn't for the life of him understand why Chad was doing his taxes outside, lol. There is a misfire there with reading non verbal ques of which they are also working on at day treatment. He has gotten better with me leaving room and going to take a shower where as before you know I had to be in his sight at all times. He's good for about 10 minutes in living room by himself while I hop in the shower and then he is calling my name, lol. Baby steps.... but I do see improvement and can tell the therapy is definitely helping him. We are to focus on the positive things that he does and REALLY REALLY build him up on those and really praise him when he does something good because that will focus his attention to those things and he will want to do that again. WE ALL LIKE POSITIVE REINFORCEMENT ANYWAYS RIGHT! He has really been working hard at therapy..... working with Ms Kate, Ms Erica and Ms Lisa getting ready for Prom! All you parents out there needing tuxes for those boys.... go see Tim Shurling at Karls at the town center .... they have great deals!!! The video is taking forever so maybe I can upload it later. At times it's hard to watch him trying to dance because before this whole ordeal he was an awesome dancer always knew the new dances and latest moves....he and Nick were a team to be reckoned with! So it's hard for me to sit and watch him struggle at what I know he was so good at.... but yes...I am thankful he is alive to even be getting the chance to learn it all over again. FOCUS ON THE POSITIVES! Alex has since moved on to a one point cane..... IMPROVING with walking. He HATES the one point cane but I just think it's because he isn't familiar with it and doesn't trust that he can walk with this on his own just yet.... even though I KNOW HE CAN, lol! See below"
Below is video of him working with Ms Leanne his occupational therapist. Standing on his own, getting electrical stimulation on that left arm while putting a puzzle together! MULTI TASKING! Working on thought process skills as well! There was a time a couple of months ago when there was no way he could do this...SO PROUD OF YOU ALEX!! So all in all things have been looking up this past week. I am very pleased with his attitude and his progress and thank God for our awesome therapist..... WE COULDN'T DO THIS WITHOUT YOU AND YOUR AMAZING PATIENCE with Alex! LOVE YA'LL BUNCHES!! We have been very busy with school, therapy and just life in general so I apologize for the long spurts in between my blogs. We have Prom on March 25th, Hawaii (our trip from Dreams Come True) on March 27th and he will turn 18 while we are in Hawaii on March 30th! BIG MONTH FOR US!! THANK YOU GOD FOR GIVING ME THE STRENGTH TO PUSH THROUGH THE DARK DAYS....THANK YOU FOR OUR SECOND CHANCE! WE WILL DO GREAT THINGS WITH YOU...THROUGH YOU AND FOR YOU! AMEN! Hi Friends.... sorry I haven't updated in awhile.... we have been busy bee's with trying to get caught up on school work as compass odyssey was down for like 4 days and it has been a challenge trying to get Alex to want sit and do school work. I think it took him a week to complete his Algebra pre test because after 15 minutes of problems he was ready to stop lol. On his report card he got all A's and two B's so he is still doing great.... it;s just a challenge to keep him focused..... all the more reason I did NOT put him back in school in a classroom setting. Wise choice on my part. Alexander has not surfaced since that crazy Tuesday and I'm starting to realize that I think it had everything to do with the changes involved in his daily routine that day. Not to mention he woke up to start his day from a nightmare and it just spiraled downward from there. Things have been going smoothly.... KNOCK ON WOOD.... for the most part and he was a trooper at therapy yesterday doing everything they asked without complaining and pushing through the pain of it all. Normally he tries to bargain with them but yesterday before the sessions they gave him his schedule for the session with like 10-15 minute exercises and changed it up to where he didn't feel like he was doing ONE thing for the whole 45 min which i think might overwhelm him at times. HE IS GREAT WITH SCHEDULES AND STRUCTURE... however...if you divert from the original plan.... it sends him over the edge. I had a chat with one of the psychologist at Brooks and asked this question in particular. I noticed that when Chad comes in from a run, in his running clothes, hot and sweaty with earphones in his ears....you and I would clearly know that Chad just came in from running....however, Alex will look at him and say.. "Chad where did you just come from or where have you been?"... Chad being the smarty pants that he is said "I was doing my taxes outside". Alex looks at him and says "Why were you doing your taxes outside?". He doesn't make the connection based on his appearance, he takes him literally. This is one of the issues that everything is either black or white... there is no gray area. I'm not sure if this will heal over time or something he will have to face for the rest of his life. I was told he only has about 25% control over what he says and does and thinks. I pray that over time that brain heals and learns to reconnect those parts that were so severely damaged so that he can lead a somewhat independent normal life. He looks so good and is doing so great physically moving right along.... pushing forward as always that it's been hard for me to digest that the inside still has a VERY LONG road ahead. To meet Alex or spend 5 minutes with him, you would never know there are sooooo many issues that we face on a daily basis.....but to spend 24 hours with him is a whole new eye opening experience. I had a mini melt down last night... missing my Alex again... wanting our old life back....I think alot of it stems from Brooks starting baseball and knowing that Alex would be playing this year.... His senior year......possibly getting a scholarship for college.... HIS DREAM as well as mine. It breaks my heart and tears strolling down my face as I write this.... a very hard pill to swallow. I'm going to close for now.....try to regroup before the master awakes and we have to do school. Focus on the positives.....it gets me thru my darkest of days. LIFE GOES ON and IT IS WHAT IT IS! "When life give you lemons, make lemonade right?" Thank you God for another day with my handsome boy and for the many blessings you continue to throw our way and for continuing to let your light shine through me. You are my rock and I am a better person because of you! I give you all the Glory, Honor and Praise. AMEN.